Oh what fun it is to try out a bunch of new soups in the dead of winter! 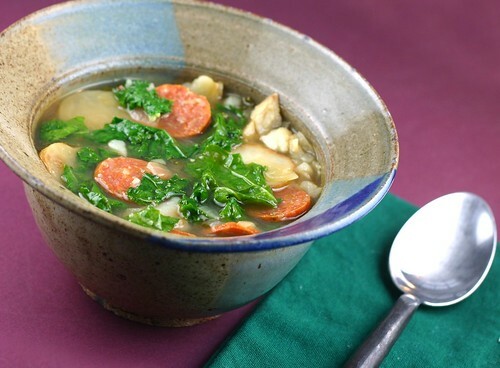 We renamed this Portuguese Caldo Verde “Pepperoni Soup” because quite frankly everybody loves pepperoni almost as much as they love bacon and this soup is not lacking in the pepperoni department. You just want to be sure to skin your pepperoni of any casing before you slice it up. And remember – the thinner you slice it the pepperoni ratio per spoonful increases. And let’s talk about little piggys. John & I inhaled oinked this soup down so fast I almost didn’t have enough to take a picture – that’s kind of emabarrassing and I probably shouldn’t be admitting it here, but I’m going to chalk it up to us just having been to the gym for a 45 minute cardio work-out and being starving. Really, it was like we’d never seen food before in our lives. 8 ounces Sliced Pepperoni – if your slicing yourself be sure to peel off the skin! Brown well on at least one side if not both. This takes awhile to do! Bring to a boil then simmer for 15 to 20 minutes. Mash potatoes with a potato masher only to break them up NOT to puree them! Speaking of pepperoni, I do love them and it’s what I’ve always wanted for a pizza. Adding them to soups would be great. This is the kind of soup that I would like to have. Pepperoni soup? What, What, What? It does sound good…and if it works for linguisa and chorizo, why not pepperoni? I think you have another winner here, Miss Mary! I love the picture and the bowl !!! I thought pepperoni is only for pizzas but this soup looks very delicious. Simple to make too. I have to try it. i loooooooooooooooooooooooove pepperroni. all along i’ve just used it for salad, pizza or simply eat it plain. now making soup sounds very interesting to me, but i bet it must taste super flavourful!